Over the last week our meals have been initiated by a body driven need to eat as opposed to any kind of time driven protocol. We have been in total slow down mode and what better opportunity to re-connect with not only ourselves but our wonderful home. We have been making some interesting discoveries as a result. “When did we get a waffle maker,” asked Lynsey as he stood there inspecting the odd shaped appliance in his hands. “I didn’t know we had one of these.” He was totally surprised by his discovery which happened while he was returning the not-so-often-used popcorn maker to the pantry. “We’ve had it for years,” replied our daughter, Zofia. “I’ve never seen it in use,” he responded. We all laughed as Zofia and I struggled to remember the last time we had actually used this appliance. In fact I had forgotten that we even had one. 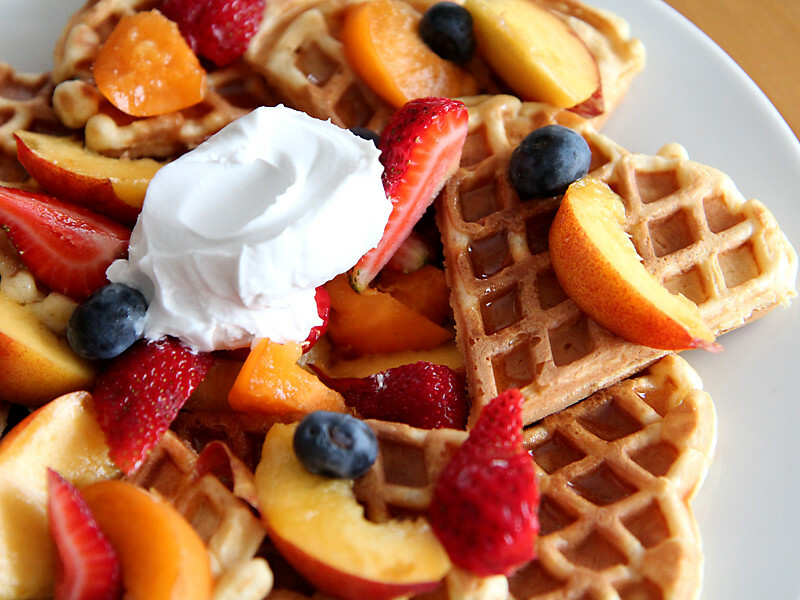 Imagine my total delight when later in the day Lynsey place before me a plate of heart shaped “dairy-free” waffles covered in maple syrup, fresh fruits and berries with a dollop of coconut cream. Not only was it a visual extravaganza that had been so lovingly cooked and put together, it tasted delicious as well. I so love my husband and the way he looks after not only me but our entire family. He puts so much love into everything he does and he is the best cook ever. I feel so incredibly blessed. Life is so very, very good. 27 Dec This entry was written by Marica, posted on December 27, 2014 at 11:48 pm, filed under creativity, eating in, everyday skills, family, food, fun, gratitude, love, summer, wellbeing and tagged gadgets, holidays at home, relaxing, slow down, summer delights. Bookmark the permalink. Follow any comments here with the RSS feed for this post. Post a comment or leave a trackback: Trackback URL.